While pursuing other game, one occasionally comes upon odd bits of Blake’s work as a printmaker or facts about his etchings and engravings not recorded in the standard bibliographies and catalogues. *↤ For assistance with information presented here, I thank Jacquelynn Baas of the Hood Art Museum, Betsy Barofski of Rutgers University, G.E. Bentley, Jr., Thomas Lange of the Huntington Library, Phillip Lapsansky[e] of the Library Company of Philadelphia, Janice Lyle, L. Candace Pezzera of the Rhode Island School of Design, and Peter Van Wingen of the Library of Congress. These serendipitous discoveries hardly revise our sense of Blake’s achievement as a graphic artist, but they do fill minor lacunae in the complete picture. 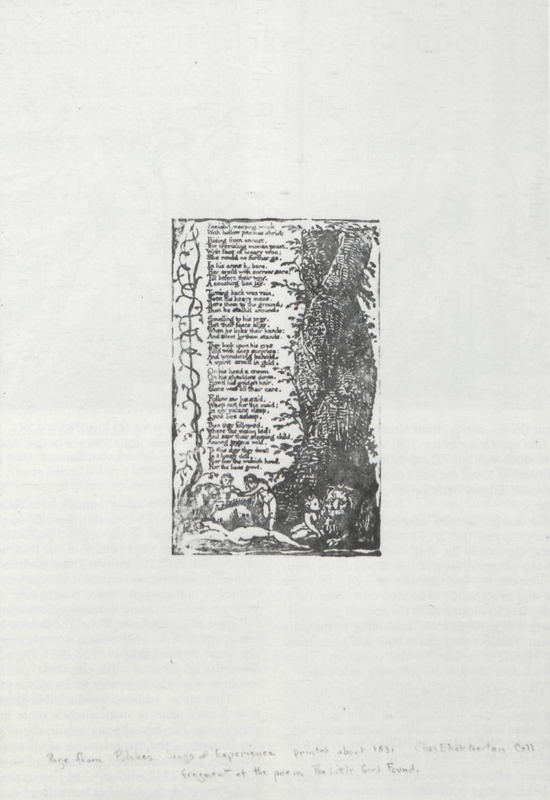 The first two notes below contribute to the bibliography of Blake’s illuminated books; the second two add details about Blake’s work as a commercial engraver. Bentley’s Blake Books records four loose impressions of the final plate of Blake’s Europe in three different collections: two in the Rosenwald Collection of the Library of Congress (from copy c) and one each at Trinity College, Hartford, Connecticut, and the Lockwood Memorial Library of the State University of New York at Buffalo.1↤ 1 G. E. Bentley, Jr., Blake Books (Oxford: Clarendon Press, 1977), pp. 143, 161, 163-64. The impression of pl. 18 at Trinity College is listed with an impression of pl. 2 in the chart on p. 143, but it is not referred to in the catalogue entry on Europe plates at Trinity College, p. 162. Yet a fifth impression, not previously noticed, is in the Museum of Art of the Rhode Island School of Design, Providence, Rhode Island (illus. 1). This print in reddishbrown ink (like one of those at the Library of Congress and the example at Trinity College) is on unwatermarked wove paper, 27.6 × 21.3 cm. The impression is in the last of three states of the plate, without the final four words of the first line of text (“before the trumpet blew” — see illus. 2) and the squiggle conclusion of the tail descending from the first letter of “And” (first word in the penultimate line).2↤ 2 The first state appears in proof copy a (illus. 2), the second in copy c (a miscellaneous group of proofs), and the third state in all other copies, including those color printed by Blake on paper watermarked 1794 (A, C). The second state from copy c is reproduced in William Blake, Europe: A Prophecy (1794), Introduction by G. E. Bentley, Jr. (Memphis: American Blake Foundation, 1978), pl. 38. The presence of the etching dike as a border line around the print, as well as a certain flatness in the printing of the large relief areas, suggest that this is a posthumous impression. The School of Design purchased the print in April 1947 from an unrecorded source, probably a dealer. I have not been able to trace the provenance of this impression or associate it with the history of any group of Europe plates. Posthumous copy o of Songs of Innocence and of Experience was once in the collection of Charles Eliot Norton (1827-1908). Bentley records that the volume originally contained seventeen plates on seventeen leaves,3↤ 3 Blake Books, p. 371. Geoffrey Keynes and Edwin Wolf 2nd, William Blake’s Illuminated Books: A Census (New York: Grolier Club, 1953), p. 69, records eighteen plates on eighteen leaves. but it was broken up by the New York bookdealer E. Weyhe in 1938 and the plates sold individually. Most are untraced, but a previously unrecorded impression of the final plate of “The Little Girl Found” (illus. 3) in the Hood Museum of Art, Dartmouth College, Hanover, New Hampshire, would seem to be from copy o. Stitchmarks along the left margin indicate that the leaf of unwatermarked wove paper was once bound. The neat pencil inscription, with its reference to the “Chas Eliot Norton Coll.,” is much the same as the note (“Chas E. Norton Coll.”) on “The Sick Rose” from copy o now in the collection of G.E. Bentley, Jr. The leaf size is identical (28 × 18.6 cm.) to “The Sick Rose,” but the ink is dull black in “The Little Girl Found” rather than orange-brown. Other posthumous copies contain a mixture of two or even three ink colors. The print was given to the Hood Museum in January 1948 by Dr. F.H. Hirschland, who probably acquired it from Weyhe. 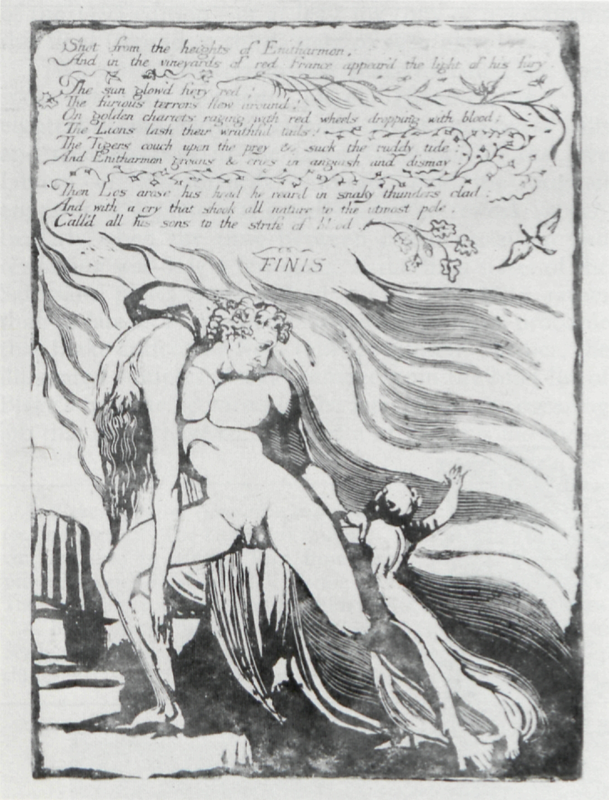 Because of complexities involved in their attribution to Blake, the fifty-one plates in C.G. Salzmann’s Elements of Morality have attracted more attention than their artistry would warrant.4↤ 4 The most recent article, with an overview of earlier opinions, is Robert N. Essick, “The Figure in the Carpet: Blake’s Engravings in Salzmann’s Elements of Morality,” Blake / An Illustrated Quarterly, 12 (1978), 10-14. I argue in the article that forty-five of the plates were engraved by Blake. The text is of some interest because Mary Wollstonecraft was its translator. As she notes in a signed “Advertisement,” she “made some additions” to the original German text, “and altered many parts of it.” The “little tale, to lead children to consider the Indians as their brothers,” is her own “inserted” story. Wollstonecraft also points out the similarity between Salzmann’s book, first published as the Moralisches Elementarbuch in Leipzig in 1782, and her own Original Stories from Real Life, 1788. The direction of influence is clear. 1. Blake. Europe, pl. 18, third state. Relief etching, 23.4 × 16.6 cm. Museum of Art, Rhode Island School of Design, Providence. book without them—and without altering the titlepage. The plates first appearing in the 1791 edition were used again in the three-volume “Third Edition” of 1792, the “Fourth Edition” of 1799, the 1805 edition, and the two-volume “Juvenile Library” edition of c. 1815 published by John Sharpe.6↤ 6 Bentley, Blake Books, pp. 607-608; and Roger R. Easson and Robert N. Essick, William Blake: Book Illustrator, Volume II (Memphis: American Blake Foundation, 1979), pp. 69-70. W. Clark Durant suggests that “like Blake’s French Revolution,” the 1790 edition of the Elements “was set up in type by Johnson in 1791 [sic? ], and only one copy of proofs struck off.” See William Godwin, Memoirs of Mary Wollstonecraft, ed. Durant (London: Constable, 1927), p. 200. ELEMENTS / OF / MORALITY, / FOR THE / USE OF CHILDREN; / WITH AN / INTRODUCTORY ADDRESS TO PARENTS. / [double rule] / Translated from the German of the / Rev. C. G. SALZMANN. / [rule] / IN TWO VOLUMES. / [double rule] / VOL. I. [II.] / [double rule] / LONDON: / PRINTED FOR J. JOHNSON, IN ST. PAUL’S CHURCH- / YARD. / [rule] / M,DCC,XCIII. 2. Blake. Europe, copy a, pl. 18, first state. Relief etching, 23.4 × 16.6 cm. British Museum. 3. Blake. Songs of Innocence and of Experience. Copy o, plate 36 (second plate of “The Little Girl Found”). Relief etching, 11.2 × 6.9 cm. Inscribed in pencil, “Page from Blake’s Songs of Experience printed about 1831 Chas Eliot Norton Coll. Fragment of the poem The Little Girl Found.” Hood Museum of Art, Dartmouth College. begin page 133 | ↑ back to top of the 1793 edition—or at least my copy of it—contains this final (second or third) state of each plate. 4. Blake after an unknown artist. “Lyons.” First state, 1782, from Seally and Lyons, A Complete Geographical Dictionary. Intaglio etching/engraving, 14.5 × 20.5 cm. Author’s collection. not his reputation. The paucity of graphic projects Blake was involved with in the last years of the decade, now known to be slightly more acute, may have been one of the reasons for his decision to move to Felpham and mortgage his professional future to the good intentions of William Hayley. A common reason for reworking even the most modest book illustrations was to compensate for wear in the copperplates. A good case in point is James Heath’s “restoration” of Hogarth’s much-printed plates. The wear in the Salzmann plates is modest, as even the 1799 edition shows. Blake’s simple line etching/engravings, with many large white areas and few fine lines, held up well through at least the 1792 pulls. Some of the final states contain the reengraving of light hatching lines, but the most significant addition on most plates is the stipple shading added to faces. The motivation for such work may have been the publisher’s desire to add details and tone to plates which, in their first states, look almost like unfinished proofs.9↤ 9 This open, unfinished effect also appears in some of Blake’s illustrations for Wollstonecraft’s Original Stories (1791), Young’s Night Thoughts (1797), and Charles Allen’s New and Improved History of England and New and Improved Roman History (both 1798). Among Blake’s earliest copy engravings are the three plates, signed by him and dated 1782 in their imprints, published in John Seally and Israel Lyons, A Complete begin page 134 | ↑ back to top Geographical Dictionary, n.d. (c. 1784?). The less said about the quality of Blake’s work the better. Without signatures, one would have no reason to attribute them to his hand. A second edition of Seally and Lyons appeared in 1787 with the same states of the same three plates.10↤ 10 According to Bentley, Blake Books, p. 613, and Easson and Essick, Blake: Book Illustrator, II, 47-48. The latter includes reproductions of all three plates in the first states. I recently acquired from Donald Heald loose impressions of these plates in heretofore unrecorded states. Stab holes along the lower edge of each sheet strongly suggest that they were removed from a book. A reasonable supposition would be that these new states, clearly later than those previously recorded, appeared in some unrecorded reissue of Seally and Lyons. Heald, however, told me that his source for the loose impressions took them from a volume called “Adam’s [Adams’?] Geography.” Given this slim lead, Jenijoy La Belle searched through every “Adam” and “Adams” in the National Union and British Museum catalogues. Diligence was rewarded with the discovery that the Seally and Lyons illustrations were reprinted in two further publications with two of Blake’s plates in two unrecorded states. THE / New Royal / Geographical Magazine; / or / A Modern, Complete, Authentic and Copious / System of Universal Geography / Containing Complete, Full, Particular and Accurate / Histories and Descriptions of / Europe, Asia, Africa & America, / [rule] as divided into [rule] / [four columns, divided by vertical rules] Empires, / Kingdoms, / States, / [vertical rule] / Provinces, / Republics, / Governments, / [vertical rule] / Continents, / Islands, / Oceans, / [vertical rule] / Seas, Rivers, / Gulphs, / Lakes, &c. &c. / Including all the New Discoveries. /Written&Compiled by Michael Adams, Esqr. / Assisted by many Gentlemen, eminent in the Science of Geography. / [three engraved devices, the group signed Thorowgood Sculpt., Chalmers delin., and Wise Sculpt.] / London: / Published by Alexr. Hogg, at the King’s Arms, No. 16 Paternoster Row. / And Sold by all Booksellers in Great Britain & Ireland. THE NEW ROYAL / Geographical Magazine; / Or, A Modern, Complete, Authentic, and Copious / SYSTEM of UNIVERSAL / GEOGRAPHY: / CONTAINING / A Complete, Full, Particular, and Accurate History and Description of all the several Parts of / THE WHOLE WORLD; / AS DIVIDED INTO / [six columns, divided by vertical rules] EMPIRES, / KINGDOMS, / [vertical rule] / STATES, / PROVINCES, / [vertical rule] / REPUBLICS, / GOVERNMENTS, / [vertical rule] / CONTINENTS, / ISLANDS, / [vertical rule] / OCEANS, / SEAS, RIVERS, / [vertical rule] / GULPHS, / LAKES, &c. / Together with New Accounts of their / Soil, Situation, Extent, and Boundaries, in EUROPE, ASIA, AFRICA, and AMERICA: / With a very particular Account of their SUBDIVISIONS and DEPENDENCIES; / Their CITIES, chief TOWNS, UNIVERSITIES, and HARBOURS; with their COMMERCE, TRADE, / LEARNING, POLICY, ARTS, MANUFACTURES, GENIUS, MANNERS, CUSTOMS, &c. / AS WELL AS THEIR / Revenues, Forces, Revolutions, Curiosities, Buildings, Antiquities, Ruins, Mountains, Mines, / Animals, Vegetables, and Minerals; / And whatever is found curious, useful, and entertaining, at Home and Abroad. / TO WHICH WILL BE ADDED, / A New and Easy Guide to GEOGRAPHY and ASTRONOMY, / The Use of the GLOBES, MAPS, &c. and the DOCTRINE of the SPHERE; / With an Account of the / RISE and PROGRESS of NAVIGATION, its Improvements and Utility to Mankind; / TOGETHER WITH / CHRONOLOGICAL TABLES of the SOVEREIGNS of the WHOLE WORLD. / Including every Interesting DISCOVERY and CIRCUMSTANCE in the Narratives of / Captain COOK’s VOYAGES Round the World, / Together with all the recent DISCOVERIES made in the / PELEW ISLANDS, New HOLLAND, New SOUTH-WALES, BOTANY-BAY, / Port-Jackson, Norfolk-Island, North and West Coasts of America, the Interior Parts of / America, Africa, China, Caffraria, India East and West, Arabia, Madagascar, Russia, &c. / Carefully written and compiled from the late Journals of the Voyages and Travels of / Captains Phillips, King, Ball, Hunter, White, Dixon, Portlock, Morse, Blyth, Brissot, Hodges, &c. / [rule] / By MICHAEL ADAMS, Esq. of Lincoln’s-Inn, London. / Assisted by a Society of Gentlemen who have respectable Correspondents in the various Parts of the World, for the / Purpose of obtaining the most authentic Geographical and Historical Descriptions of the present State of the Universe. / Illustrated with a beautiful Set of Engravings, consisting of Maps, Charts, Plans, Harbours, Views of Cities, Towns, &c. / [double rule] / LONDON: Printed for the PROPRIETORS: / Published and sold by ALEX. HOGG, at the King’s-Arms, No 16, Paternoster-Row; sold also by Symonds, Parsons, &c. / And may be had of all the Booksellers and News-Carriers in England, Wales, Scotland, and Ireland. The Publisher, Alexander Hogg, specialized in parts publications, some issued at the rate of one a week and known as “Paternoster Row numbers.”11↤ 11 See Ian Maxted, The London Book Trades 1775-1800 (Folkstone, Kent: Dawson, 1977), p. 112. Hogg was active at 16 Paternoster Row c. 1778-1819, and thereafter on Mark Lane to c. 1824. Adams’ Geographical Magazine was no doubt issued in some such fashion. The only copy I have been able to locate is in the collection of the Library Company of Philadelphia. 1. LYONS (first state, illus. 4). In the second state, the imprint (Publish’d May 4 1782 by J. Fielding, No. 23 Pater-noster Row.) has been removed and the title changed to VIEW OF LYONS,IN FRANCE. In the design, a few of the smaller buildings show small patches of additional crosshatching. The two hillocks, lower left on the near side of the river, have been crosshatched on their shady sides. The crosshatching in the shadow below the hillocks has been extended further down and to the right. The clump of trees below and to the left of the left hillock has been partly ruled through with horizontal lines. Blake’s signature lower right, only lightly scratched into the first state of the plate, does not appear. It may simply have worn away. However, the inner framing line just below the signature has been strengthened with an additional stroke of the graver (see third state, illus. 5), perhaps to repair the inadvertent erasure of the frame while scraping and burnishing away Blake’s signature. 2. OSNABURG in WESTPHALIA. The first-state imprint has been removed. There is no clear evidence of additional work in the design. Blake’s signature, lower right, no longer appears. 3. 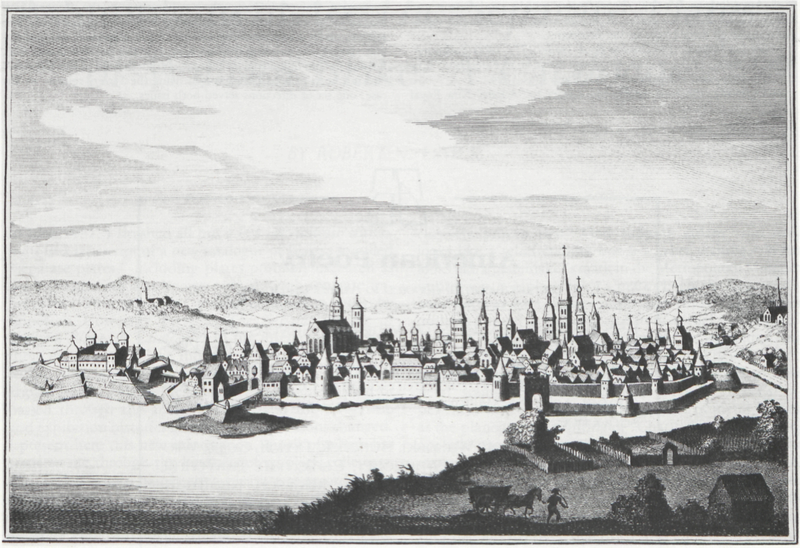 PRESBURG in HUNGARY (illus. 6). The first-state imprint has been removed, although tiny fragments of it still appear below the title. There is no clear evidence of additional work in the design. 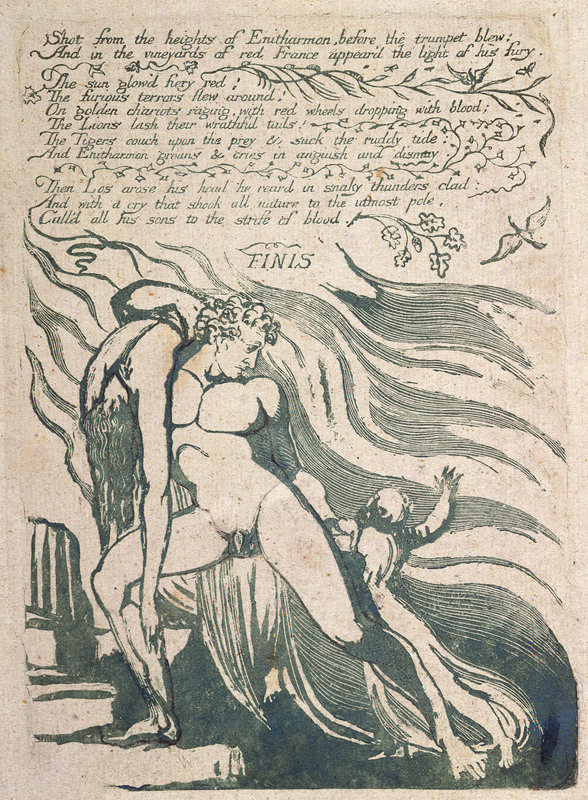 A faint shadow of Blake’s signature still appears in the lower right corner between the design and its framing line. The change in publisher, from John Fielding to Scatcherd and Whitaker, between the first and second editions of Seally and Lyons did not occasion the removal of Fielding’s imprints on the plates. But the reason for Hogg’s removal of the imprints may have been to eliminate another publisher’s name and the evidence that the “beautiful Set of Engravings” he trumpets on the titlepage included the third printing of plates executed for another book some eleven years earlier. 5. Blake after an unknown artist. 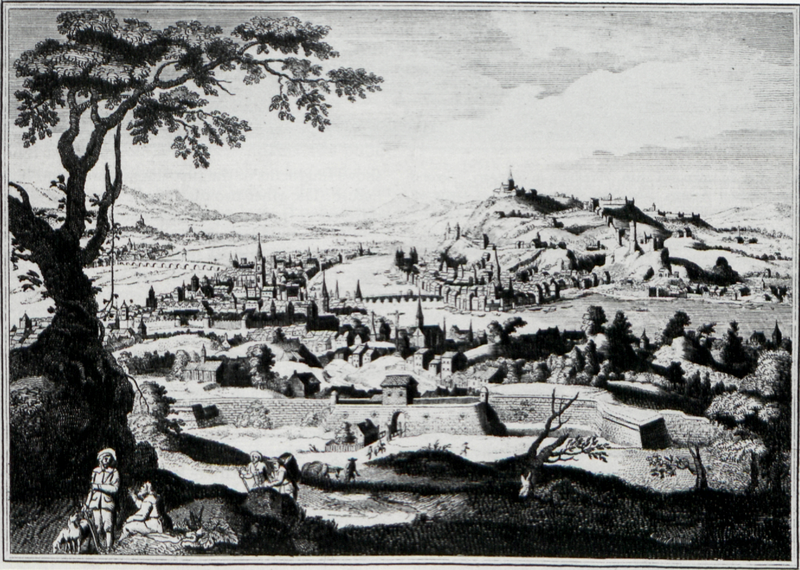 “View of Lyons, in France.” Third state of the plate in illus. 4. From Michael Adams, The New Royal System of Universal Geography (c. 1794-1796). Author’s collection. The Whole forming a Complete, Authentic, Copious, and Real / New Geographical Library. / [rule] / By MICHAEL ADAMS, Esq. of Lincoln’s-Inn, London; / AUTHOR of the New, Complete, and General BIOGRAPHICAL DICTIONARY, / Now Publishing, in Ninety-Six Periodical Numbers, with universal Applause. / Assisted by a Society of Gentlemen who have respectable Correspondents in the various Parts of the World- / [rule] / Illustrated with a beautiful Set of Engravings, consisting of Maps, Charts, Plans, Harbours, Views of Cities, Towns, &c. / [double rule] / LONDON: Printed for the PROPRIETORS: / Published by ALEX. HOGG, at the King’s-Arms, No 16, Paternoster-Row; and sold by all the Booksellers and News-Carriers / in England, Wales, Scotland, and Ireland. 6. Blake after an unknown artist. “Presburg in Hungary.” Second state from Michael Adams, The New Royal System of Universal Geography (c. 1794-1796). Intaglio etching/engraving, 15.5 × 21.3 cm. Author’s collection. same date written in pencil on the typographic titlepage of the LC copy. The Rutgers copy, however, bears a pencil date of “1796?” The revisions in the plates indicate that Adams’ System was issued after his Magazine, and thus 1794 would seem to be an approximate terminus a quo for the former. The reissue was published in periodic parts, perhaps beginning immediately after the conclusion of the first issue. The number and placement of plates and the “Directions to the Binders” are unchanged in the reissue.12↤ 12 Curiously, the binding directions refer to “Adams’ New Royal System of Universal Geography” rather than to the Geographical Magazine in which they first appeared. Perhaps publication of the reissue, under a version of the subtitle of the Magazine, was contemplated while still printing the first issue. It is also possible that p. 956, bearing the binding directions four pages from the end of the Magazine, had not been printed before commencing the System reissue. In any case, one set of directions served both issues. 1. 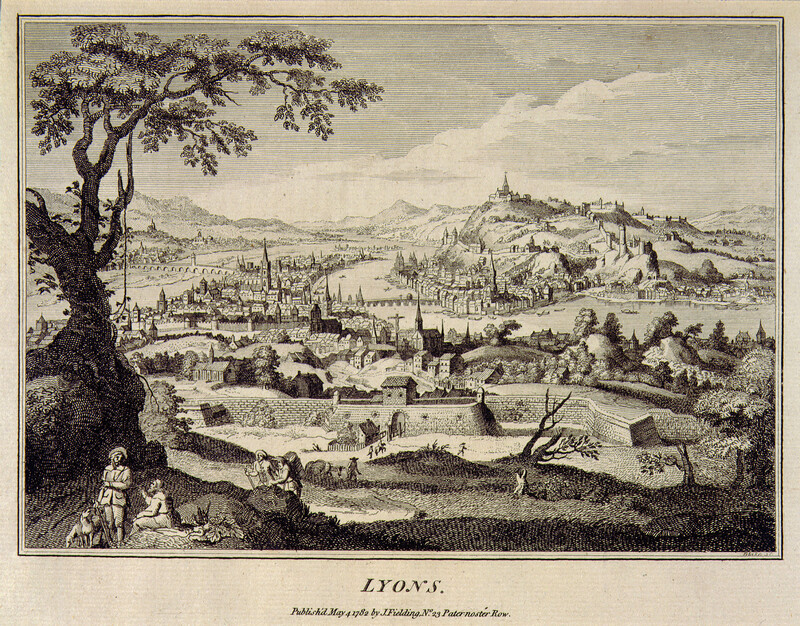 View of Lyons (illus. 5). Crosshatching has been added over the sketchy lines indicating vegetation in the right foreground. The shady areas on the far side of the river have been darkened with crossing strokes. Many of the roofs on the near side of the river and the shaded sides of buildings have been darkened. This additional work, coupled with wear in the finer lines of the plate, creates a much greater contrast between light and dark passages. 2. 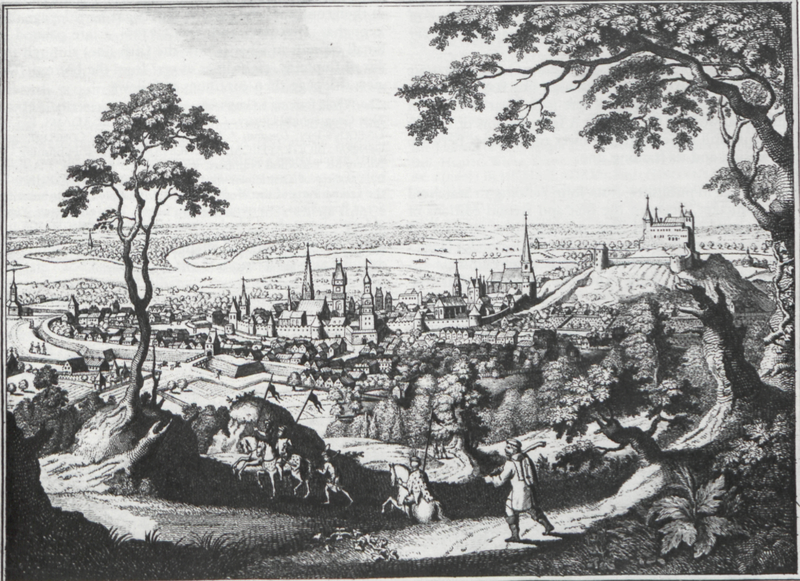 Osnaburg in Westphalia (illus. 7). A good deal of hatching and crosshatching has been added to roofs and the shaded sides of buildings, much as in the third state of Lyons. The most easily observed revision appears just to the left of the archway leading into the city, about 2.5 cm. above the horse pulling a cart. In this area, the shadowed side of the tower and wall between the tower and the archway show vertical hatching strokes in the first and second states. Horizontal strokes have been added in the third state. 7. Blake after an unknown artist. “Osnaburg in Westphalia.” Third state from Michael Adams, The New Royal System of Universal Geography (c. 1794-1796). Intaglio etching/engraving, 14.8 × 21.7 cm. Author’s collection. All impressions I have seen of Blake’s three views in Seally and Lyons are on laid paper. Adams’ two publications have text and illustrations on both laid and wove stock. In the LC copy of the Royal System, “Lyons” is on wove but the other two plates are on laid. The three final state impressions in my collection, no doubt torn from a copy of the Royal System issue, are all on wove paper.